With a graceful pageantry that has long captured the imagination of poets and artists, the brilliant foliage of autumn in Canada has made the nation a fall destination for visitors from around the world. As the final harvest nears an end, flushed from coast to coast with showy russets, warm coppers, intense purples, vibrant golds and glossy greens, Canada’s beauty in autumn is perhaps surpassed only when this riot of colour is doubled in the silver mirror of a still lake. A gorgeous gift to celebrate an autumn birthday, a special moment, or for the lovers of art and nature in your life. Order yours today! • Your eye-catching coin showcases the beauty of Canadian autumn, rendered with world-class artistry and skilful melding of design, painting and engraving. 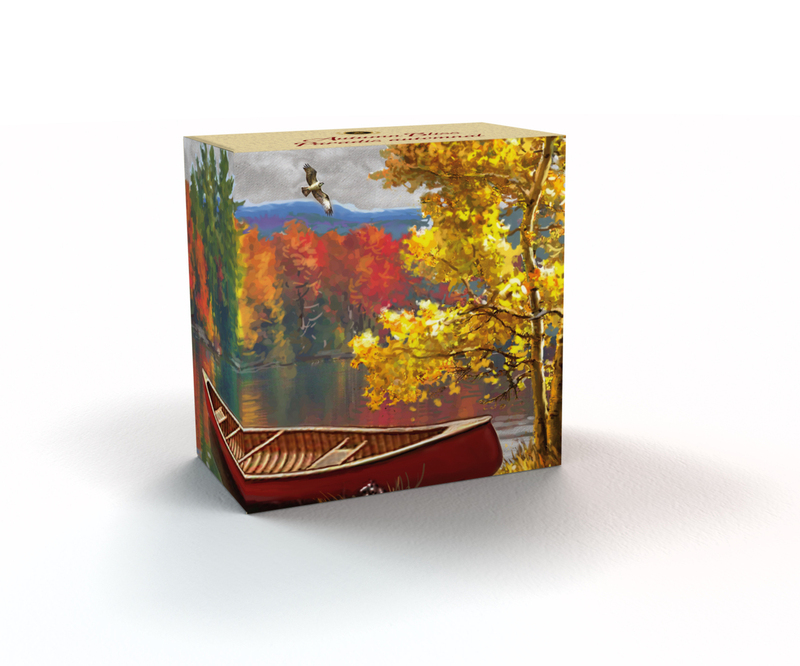 • A distinctive addition to your collection featuring painting, original artwork, the Canadian landscape, Canadian traditions, or Canadiana. • Low mintage of only 7,500 coins, your coin is rendered in 99.99% fine silver and is GST/HST exempt. 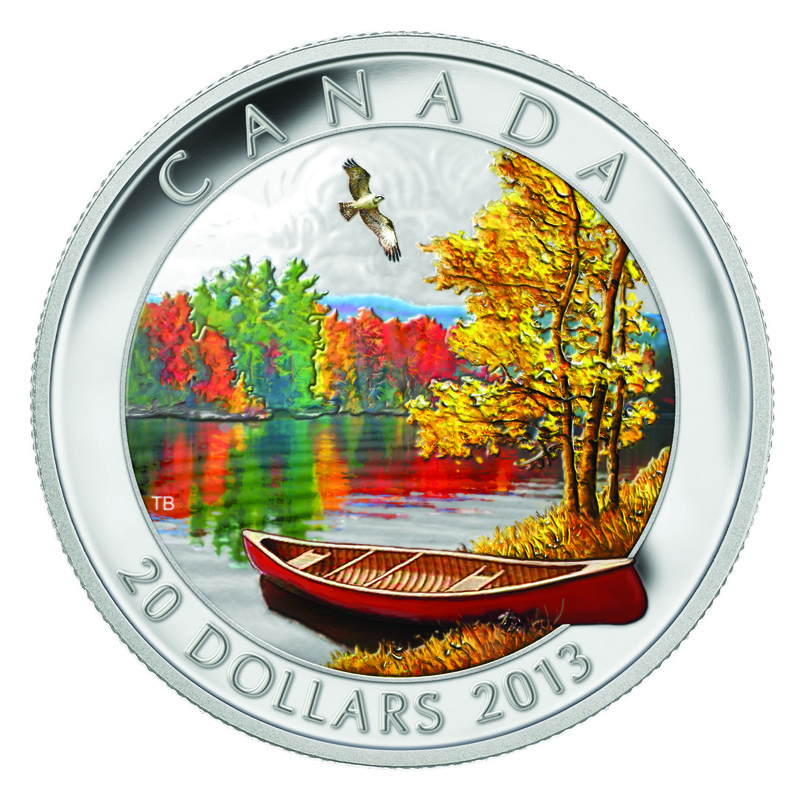 Your coin was designed by Canadian artist Tony Bianco and features a striking autumn scene on a still Canadian lake. In the foreground, a red canoe sits on a shoreline of tall yellow grasses and white late-summer flowers, beside a golden-leaved aspen stand. The canoe floats on the shallows of a still lake, its bow drawing the eye towards the far (or opposite) shoreline. This distant shore is lined with impressionistic pops of bright red, green and yellow that are reflected in the lake below. On the horizon, indigo mountains rise toward a cloudy autumn sky. In the sky above the lake, an osprey spreads its wings in flight, a work of exceptional artistry and detail in and of itself. Devised to benefit from the coin’s silver surface, the design combines skilful painting and careful engraving to render a painterly scene that captures the sparkling mood of this ephemeral moment. 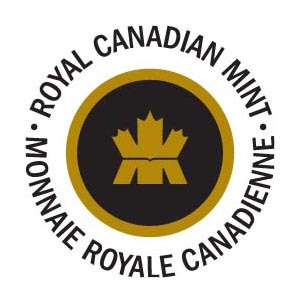 Your coin is encapsulated and presented in a Royal Canadian Mint-branded maroon clamshell case lined with black flock and protected by a custom beauty box.